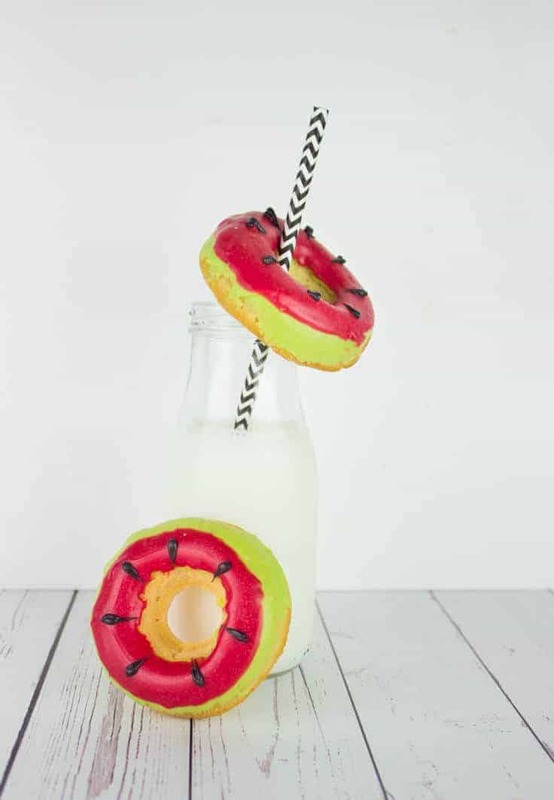 Home » Recipes » Course » Desserts » Watermelon Doughnuts – An EASY Summer Dessert! 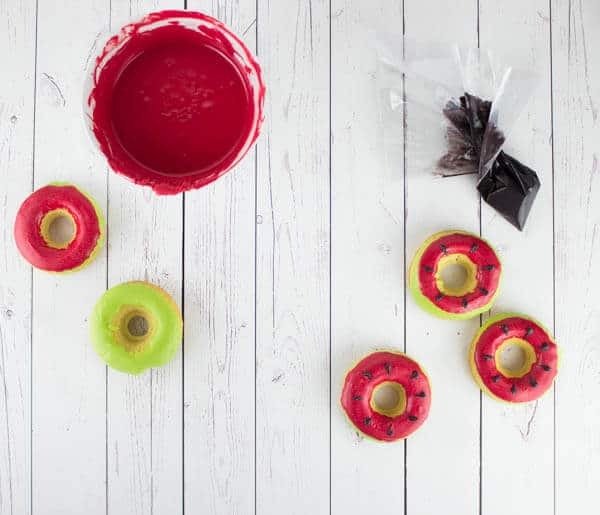 Watermelon Doughnuts – An EASY Summer Dessert! 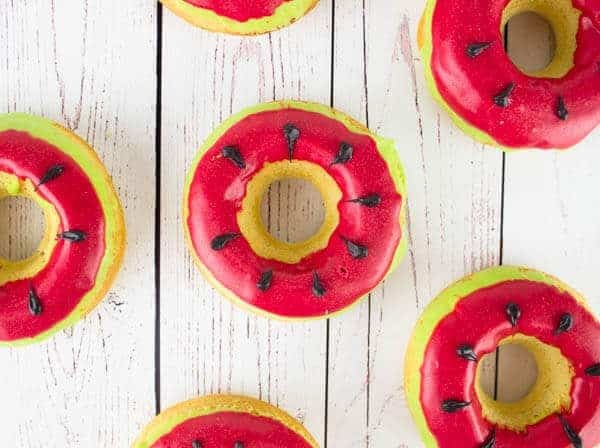 Bright, fresh and just in time for summer, these easy Watermelon Doughnuts are every bit as tasty as they are cute! The perfect dessert for a BBQ or your next summer get-together! Helloooooooooooo sweet Princess Pinky Girl readers! It’s Claire from The Simple, Sweet Life back with another recipe to make your day juuuust a little bit sweeter! If you’ve spent any time around my blog (heck, even if you’ve just spent time around my Princess Pinky Girl guest posts) you’ve probably discovered that I have a number of culinary obsessions: ice cream, anything I can turn into a s’more, Halloween… The list goes on my friends. (love s’mores – check out Princess Pinky Girls S’Mores Bites – they are too die for! But my two biggest obsessions (excluding Halloween, of course <– says the woman who’s already making Halloween plans and who may or may not have already tied a recipe on her blog to Halloween this year… 6 months early. 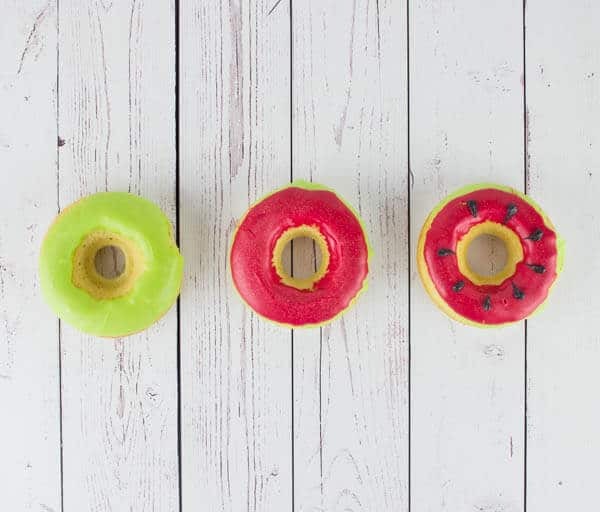 I’mma just invoke a judgement free zone on this one…) are 1. foods that look like other foods and 2. cake doughnuts (extra points for adorable kawaii animal doughnuts like these chicks and these chicks). I bought a cake doughnut pan 3-4 years ago and haven’t looked back. Seriously, if you don’t already own a doughnut pan, go buy one. Like now. It’s cool, I’ll wait. Got that doughnut pan in your life? Goooooooooooooooooooooooood. This post, is the best of both of those worlds… With a double helping of summery goodness on top. 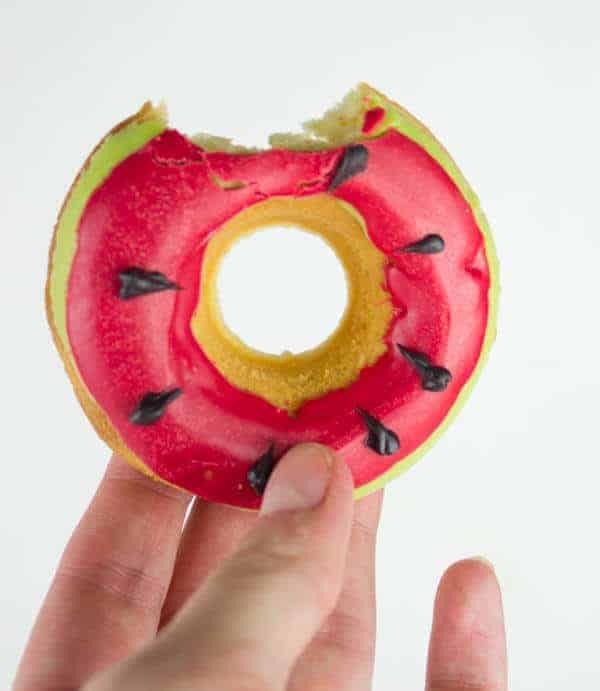 That’s right, we’re talking WATERMELON DOUGHNUTS! Get it?! 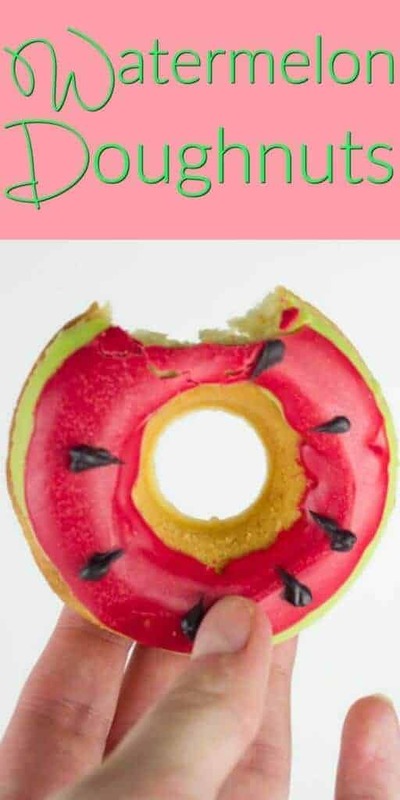 They’re doughnuts (culinary obsession #1) and they look like watermelons (culinary obsession #2)! Heck, they don’t even have to taste like watermelons (although they could, if you’re into that sort of thing). You could make them cotton candy if you wanted (in which case you’d get extra awesome foodie points for REALLY messing with people). Bake or buy a dozen doughnuts. If you need some baked doughnut recipes or inspiration, you can find some ideas on my blog here. Make sure your doughnuts are cooled before proceeding. Melt your green candy melts by microwaving them for 30 seconds then in 10 second increments until they're mostly melted and you can stir them smooth. 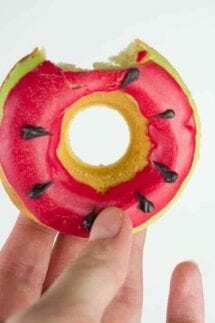 Dip your doughnuts at a slight angle coating the tops and sides. Gently shake off the excess candy melts before turning the doughnuts right-side-up on a piece of parchment or wax paper. Pour your leftover candy melts onto a piece of cling wrap, wrap securely and put aside for another project. Melt your red candy melts using the same method as the green. Dip your doughnuts into the red candy melts so just the top is coated and the green is visible. Shake off the excess and return the doughnuts to your wax/parchment paper. Wrap up the remaining red candy melts and save for a future project. Melt your black candy melts and pour into a piping bag. Pipe "seeds" onto your doughnuts by piping a circle of chocolate and quickly pulling down while letting up the pressure on the piping bag. Let the candy melts harden completely before packaging. Cake doughnuts are best eaten the day they're made. 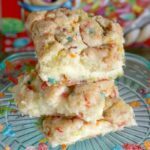 Looking for some other easy recipes? These Peanut Butter Chocolate Chip Cookie Bites are one of our favorites! 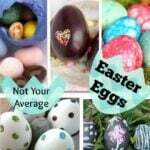 Easy to make in a quick pinch for time!